Auxiliary Air Conditioner consists of self-contained, 7,000 BTU air conditioning unit, packaged with 2,500 W inverter/charger and separate dedicated battery bank. Shorepower plug is included, so that system can run on external ac power when hookups are available. HVAC batteries automatically recharge whenever main engine is running or shorepower is hooked up. Truck's starting batteries are isolated from HVAC system's batteries. POMPANO BEACH, FL - April 22, 2005 - Dometic Corporation is introducing a new patented auxiliary air conditioning system that can be operated on a 12 Volt DC power source without idling the truck's engine or running an auxiliary power generator unit. The system consists of a compact, efficient self-contained 7,000 BTU air conditioning unit, packaged with a 2,500 Watt inverter/charger unit and separate dedicated battery bank. A shorepower plug is also included, so that the system can run on an external AC power when hookups are available. The HVAC batteries automatically recharge whenever the main engine is running or shorepower is hooked up. The truck's starting batteries are automatically isolated from the HVAC system's batteries. The low-profile air conditioning unit can be installed under a seat or bunk where space is limited. The system has a self-contained refrigerant loop that is precharged at the factory. It is not necessary to add or adjust the refrigerant at installation. 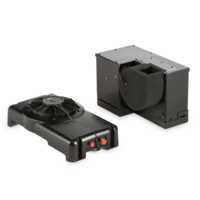 Dometic offers a turnkey package that includes all ducts, wiring, grills and thermostat control. "The 7,000 BTU system is an economical solution for truckers who have long waits at terminals," said Lou Siegel, senior vice president, marketing and strategic business development for Dometic Environmental Systems. "Using the inverter-battery combination, the system can provide several hours of air conditioner operation before it is necessary to recharge the batteries." About Dometic Corporation Dometic Environmental Systems (www.dometicenviro.com), a business unit of Dometic Corporation, is a world leader in air conditioning and refrigeration technology for marine, vehicular and other applications. The company's products are marketed under the Cruisair, Marine Air Systems, Tundra, Grunert and Sentry brand names, with a heritage dating back over 45 years. Corporate headquarters and operations are in Pompano Beach, Florida, with operations also in Richmond, Virginia. Factory-trained service facilities are located throughout the world. 2/ DC Powered AC The Dometic Group is wholly owned by EQT, a leading private equity group in Sweden, and has production facilities in 10 countries, its own sales and marketing operations in 35 countries, plus approximately 65 distributors globally.